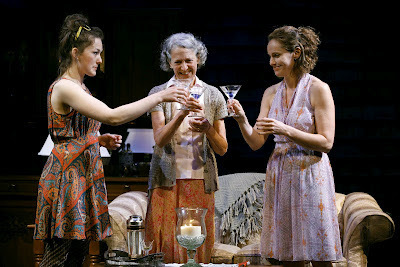 Avery (Virginia Kull), Alice (Beth Dixon) and Catherine (Amy Brenneman) ruminate about feminism in “Rapture, Blister, Burn.” Photos by Carol Rosegg. IS it just an anomaly when women don’t identify themselves as feminists? Strong women have appeared throughout history championing their equality and demanding a voice in their lives and their homes. Women’s rights have been and continue to be of serious concern, of course, and it seems like the battle of the sexes has gone on forever. Gina Gionfriddo’s “Rapture, Blister, Burn,” extended at Playwrights Horizons through 1 July, is a conversation about choices. In it proto-feminism and post-feminism take their seat next to Phyllis Schlafly as three generations of women discuss and analyze the paths they’ve chosen. The conversation in “Rapture, Blister, Burn” would not be taking place if it weren’t for the progress feminists have made over the last decades. This herstory is the background for “Rapture, Blister, Burn” in which Gwen (Kellie Overbey), Catherine (Amy Brenneman), Avery (Virginia Kull) and Alice (Beth Dixon) look around to find greater fulfillment. It’s definitely a case of "the grass is greener ... " for Catherine and Gwen. Catherine has carved out a successful career as prominent academic in “Women’s Studies.” Her old grad school roommate, Gwen, left university to support her indolent husband, Don’s (Lee Tergesen), career as a college dean. The options look to be either career or homemaker, wife or home-wrecker. Gwen would like to exchange her husband for the chance to go back and earn her degree. To her, Catherine’s life seems much more glamorous. Meanwhile, Catherine, along with her mother, Alice, is disenchanted by Catherine’s success and singledom. Avery is a young woman on the verge of also dropping out of school to join a boyfriend in a career as a reality filmmaker. The issues of feminism seem irrelevant to her, thanks to women like Betty Friedan, who duked it out with Schlafly over the role of women in their relationships with men. Catherine’s wry take on life alone is challenged by Don, who is a man who will not grow up. Avery stays above the fray with a wonderfully inquisitive detachment. The actors work off each other in a skillful ensemble. 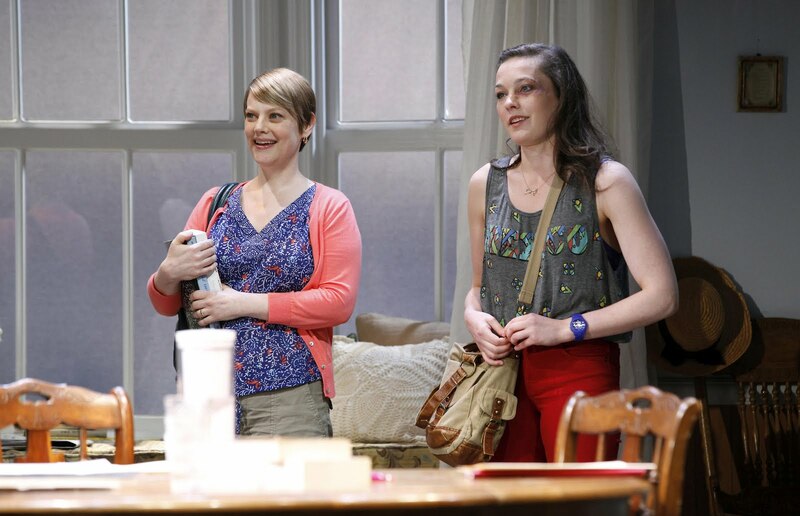 There is no hectoring or lecturing in “Rapture, Blister, Burn,” which is an amusing and thought-provoking comedy. Hello ... Thank you so much for your feedback. As I have said before, it takes a village. VEVLYN'S PEN is definitely a village operation and is better for having Tamara Beck on board to help us keep up with goings-on in the theater.